A New Collaboration Box in AZ! It all started in Dartmoor, when RTRW said, "I brought you some stamps that I carved. You are welcome to take all of them or none of them!" If you know her work and carving ability, you would have done what I did - thank her and stuff them all in your pocket to fly home and plant at a later date! Enter Butterfly - CT's Winged Wonder who wrote to me via email a few weeks ago all excited that she was going to visit a relative during the Thankgiving weekend in Arizona. "Do you have any HH's or boxes you'd like me to plant?" Now the great boxers of AZ can enjoy a joint collaboration by 4 boxing nuts from CT. 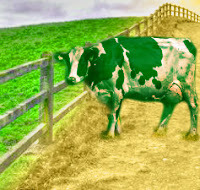 Please take good care of our little green bovine! And keep us informed of it's health! Deanne, the Lazy Letterboxer, has a new box out called "Thomas' Toy Box," which is an homage to the infant son of good friends who passed away at a very young age. This box was inspired by Zess the Treehuggers' Children's Memorial Box in Northboro, MA and borrowing the unique twist of Maiden's Jay's Toolbox from Fairview, OR. Deanne has asked that anyone from any part of the country or world who would like to contribute a toy-related stamp in memory of a special child to send it along to her. Her email is dave.deanne@verizon.net. You just have to send a stamp and Deanne will take care of the rest, including maintenance. 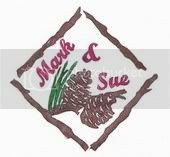 Sue & I have already signed up to do a rocking horse. Do You Live & Breathe Letterboxing? If your answer is "yes," then you'll want to begin making travel plans for the weekend of September 12 through the 14 of 2008! Because a gathering celebrating 10 years of letterboxing in the US is going to be held at Camp Adams in Molalla, OR. 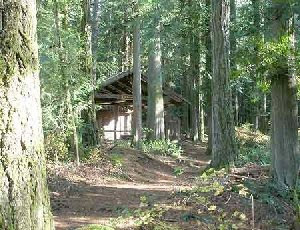 The camp, located about 35 miles south of Portland, is a residential camp with heated cabins and 210 acres of forested trails which will most likely be chocked full of letterboxing fun and surprises! One of the key organizers is Der Mad Stamper who was one of the first letterboxers in the country. You can read more about Mitch/Der Mad Stamper in our exclusive interview with him to celebrate his return to letterboxing. Mitch and his gang have begun to set plans in motion by setting up an Atlas Quest event page where you may respond and see the other almost 200 guests already signed up! They have also set up a webpage that you will want to bookmark so you can get updates as they happen. If you plan to go you must contact them directly from their official "We Live & Breathe Letterboxing" website. There is also a special Yahoo Talk List for the gathering that was started recently by Mainekokopellian. Sue & I have fashioned a week's vacation around this event. What better way to spend US letterboxing's anniversary than with 200 plus letterboxers from all over the country and Mitch Klink as one of your hosts? You'll surely be hearing more about this most important event. A while ago, we issued the challenge to other boxers in the area to place an add-on or two to our Dog Walk Series located in Kensington's Bicentennial Park, which is within walking distance of our home. It seems that this series has exploded! There are presently 15 add-ons besides our original 3 boxes! Who knows where this all end - but it's a blast watching! One day Sue & I have to take a walk there and plant our bonus but we've been waiting for the add-ons to die down. Now, we're wondering if that will ever happen! Thanks to all of the boxers who have taken up the challenge. This may end up being the largest dog-themed series in the state - or the country! Found some time tonight to finally update our letterboxing patches page. I went through all of our old email and uploaded photos and info from way back in April! Thanks to all of the senders who have been more than patient while I found the time to update the page! If you have a new patch that you would like featured on this page - or one that I might have misplaced in our email inbox! - please email me with the talklist or group it represents, the contact person, your email or snail mail address or just email contact and the price. The photo of the patch must be in jpeg format or if you have it on a web page somewhere, send me the link and I'll work with that. And just get out there and buy all of these patches! The latest entry in our Dartmoor Diary is now complete. It tells about the Monday the complete group spent scavenging on Arm Tor, Brat Tor which is home to Widgery Cross, a famous Dartmoor landmark. While Dartmoor remains just a memory from our recent trip, we continually hear about happenings there through an invaluable network of friends we've made there during the past two UK visits. Emails have been winging their way via cyberspace with some very special friends we made there so the news about all things Dartmoor continues to flow our way. The Fall Meet was once again a success and the retirement of several key Dartmoor 100 club executives was announced. The twice annual UK Letterboxing Meets, which happen on the equinox in spring and fall, are like a gathering in this country but it is done on a much, much wider scale - booths set up selling letterboxing wares, tons of people, etc. These events are so big that there are pre-meet events the day and night before! A proliferation of new, special stamps appear and excitement is truly in the air. 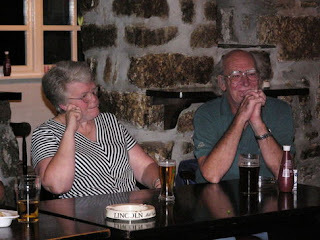 We heard from Stephanie Paul, who with her husband Roger, met with us in Dartmoor. You'll read more about that as we delve into our Dartmoor Diary but we spent a wonderful evening with them and Godfrey & Anne Swinscow at Blackadon Barn Cottages. Godfrey, through Malcolm Allderidge, had asked if we minded if the Pauls came along to the dinner since they would be taking the helm for Godfrey in the membership portion of the Dartmoor 100 club. Malcolm and his wife Angela would be taking over for Tony and Silvia Moore handling the updates to the Dartmoor Catalogue of Clues as well. While all of this was unofficial, we can now talk about it since at the just-finished Fall Meet this new guard was officially announced. It seems that Roger & Stephanie have been quite busy! They are featured on a German website and also are on a BBC radio show done by John Govier. The photo at the left shows Roger and Steph (second and third from the left) while taking Kevin on a letterboxing adventure from the radio show. You can read the story about the show here. The radio link is located at the end of the article. You'll find a reference to the Moor Tor-ists when Roger answers a question about where else there are letterboxes. There is also a clue to a new box that they planted especially for the radio show. The clue is located on the left portion of the page. Our thanks go to Godfrey & Anne Swinscow and to Tony & Silvia Moore for all of the individual achievements and contributions they have made to Dartmoor letterboxing. Sue & I are most appreciative to both couples who met with the Baker's Dozen in 2004 and with the Swinscow's who met with the Moor Tor-ists in 2007. 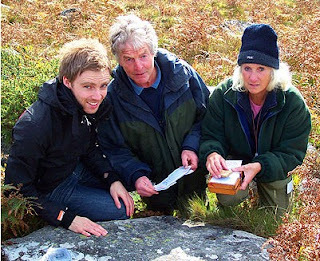 These are 4 people that typify the spirit of Dartmoor letterboxing. Godfrey was responsible for the Dartmoor 100 Club, for meeting with the national parks authority when those in charge wanted to remove all but the two Dartmoor letterboxes housed in permanent structures - Cranmere Pool and Ducks Pool. As a result of negotiations and some give-and-take, permission was granted to leave boxes within the Dartmoor National Park. One of the results of those negotiations was the development of the Code of Ethics to which all who letterbox on the moor must follow. We received two wonderful poems from Noddy, the Toytown Trekker, who we had the pleasure to meet at the Plymouth monthly meeting when the Moor Tor-ists were in town. Again, you'll hear more about Noddy in an upcoming edition of our Dartmoor Diary. Not only did Noddy, whose real name is Mark, make a special one day stamp tribute to The Moor Tor-ists, but Mark sent us 2 poems that are dedicated to Godfrey and The Moores upon their retirement from their letterboxing positions. These 2 poems commemorating the achievements of Godfrey and the Moore's are part of his rhyming Thank You Boxes. With Mark's permission, we are pleased to reproduce the poems below for your enjoyment. Sunshine pretending nothing is wrong. Willow tree, alone, continues to cry. Whilst collecting the stamps on the moor. Knowing not, of new stamps on the moor. Then shout out "Oh Heck,"
When a stamp had been moved off the moor. Making updates of stamps on the moor. It helped us find stamps on the moor. By all who found stamps on the moor. Whilst we're wet and cold on the moor. To aid us find stamps on the moor. is say a heartfelt - THANK YOU!